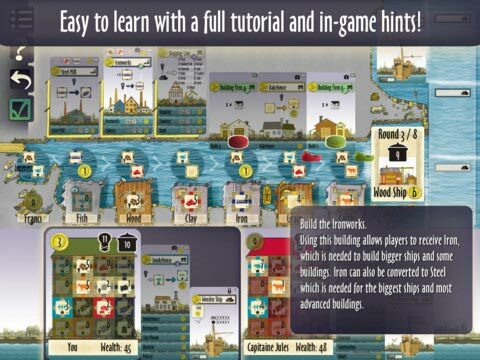 A look at the gameplay of LeHavre on iPad. I bought this game to see if I wanted to buy the hard copy of it. I want to find a light game that my girl friend and I can play together so we can get a break from Carcassonne. I started out with the tutorial which in my opinion isn’t very good. You’ll be presented with pop up windows that tells you what to do and what the AI-player does. This got too confusing for me so I ended up with watching a game walkthrough video on youtube instead. When I first understood the rules and how to play this game it took a while before I found out what I should and should not focus on – and I still don’t know for sure. As of my understanding of this game so far you can do 2 things on your turn; 1. claim one of the offers (building materials and coin), use a building OR build 1-2 buildings and 2. buy a building. You wont be able to do both on every turn you have, so the way to success is to plan what offers you should claim or what buildings to use so that you will be able to build and buy buildings and ships as often as possible. Since your playing with one or more players and buildings can only be used once in a while, your planned strategy will sometimes not work when your fellow player occupies a building you want to use. But that’s the nature of these types of games. Of a total of 10-12 playthroughs I’ve only managed to win once and I feel that was dependent on quite much luck. 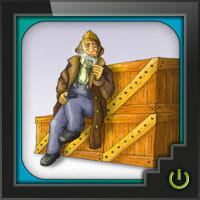 I play Le Havre on my iPhone. For this game I wish that I had an iPad cuz the screen is way too small so I have to zoom in and out a lot to check the details of all the cards. 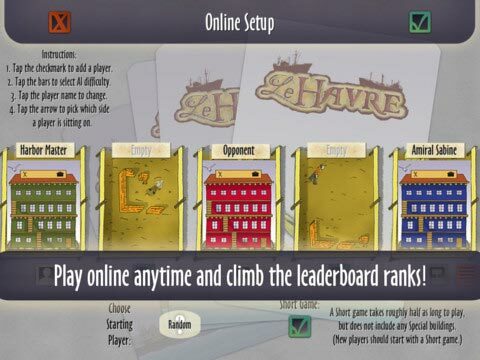 Le Havre is game designed by one of the hottest designers in the industry, Uwe Rosenberg. This is second game in his big trilogy of worker games: Agricola, Le Havre, and At the Gates of Loyang. Le Havre was designed by getting rid of some of the tenser moments in Agricola which make you feel like you’re scraping by as a medieval farmer to a more of a game about optimizing your choices as you deliver, sell, and pick up goods as shipping company in France without big penalties. Le Havre is all about collecting francs to win the game. You do this in many different ways such as picking up raw materials and converting them to goods that can be sold or picking up francs. You can also earn francs by buying buildings that other players will have to pay fees to use your buildings. You really have to balance things out by feeding your workers at the end of each round, but this isn’t near as bad as Agricola harvest time partly because you can make your loans later in the game where it’s harder to get rid of begging cards in Agricola. You can also play on the same buildings as other players on the final round of Le Havre, so you’re not blocked out of some last minute scoring opportunities. Each player begins with a ship and some francs. You take turns traveling down the harbor either picking up resources on the docks determined randomly (wheat, francs, fish, clay, iron, wood, cattle), visiting buildings to perform certain actions. Players can also buy buildings to allow them to perform actions for free on future turns, sell buildings at half their value, pay off loans, buy ships (helps with feeding your workers). Normally, you visit buildings to enhance or improve the resources you have collected making them more valuable to sell or helping you building more complicated items like advanced ships. The game becomes a constant back and forth between converting goods for better options, keeping track of new available resources all the while feeding your workers each round that keeps increasing and hoping your francs continue to keep pace with everyone else or above. I liked Agricola when I first bought it, although it is not my favorite. I get a little tired of managing all the little bits during the resupply phase of the game and keeping track of everything. The design was tight, so I had Le Havre on my radar while reading a lot of rave reviews. However, I’ve never been able to pull the trigger for two reasons: it looks extremely fiddly just like it’s cousin Agricola and looked like a “nicer” version of Agricola. I figured buying the iPad version would be a compromise rather than plunking down full price for the board game. I must say that I’m glad I did, because I probably will not by the board game for myself. If you don’t like fiddly games, then just get the digital version and let the computer do all the work. Also, Le Havre seems a little less exciting to me than Agricola. Agricola has me caring more about my little farm then my shipping enterprise in Le Havre. I feel like I really need to make every action count in Agricola than Le Havre or my little farm could really be in for a tough harvest. Le Havre feels a little more forgiving in some ways especially the last round by allowing other players to use the same building. Allowing only one worker per action in Agricola can be such an essential way to seal your victory sometimes by denying other people the action they need on that last round. Overall, I’ll stick to Agricola in cardboard format for now, and play Le Havre in digital at my leisure. Add a Review for "Le Havre"